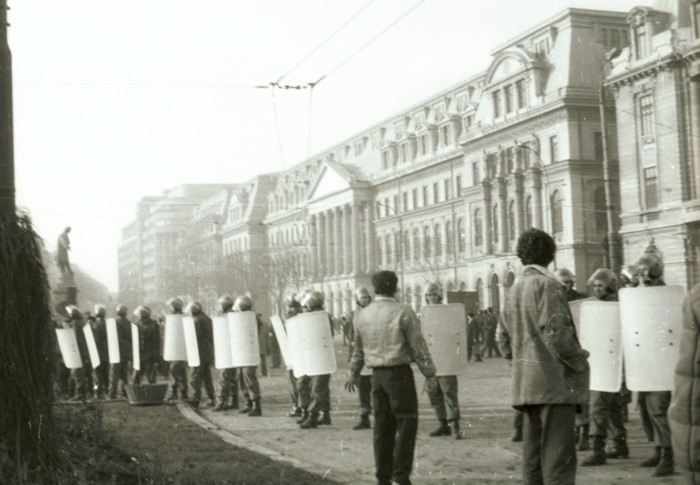 December 21, 1989 marked the beginning of the popular uprising in Bucharest, later known as the Romanian Revolution. 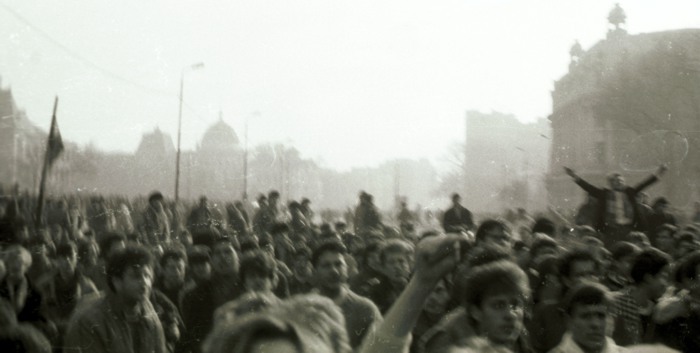 I began to take pictures that late morning, after Nicolae Ceausescu's grand meeting in the Palace Square (today the Revolution's Square) was disrupted. 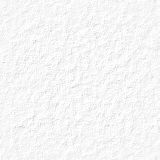 The disruption was caused by few people who managed to make a lound noise, such a noise that panicked the huge mass of people applauding Ceasescu's speech. The immediate result was a mass flow of people running from the Palace Square. That was the beginning. 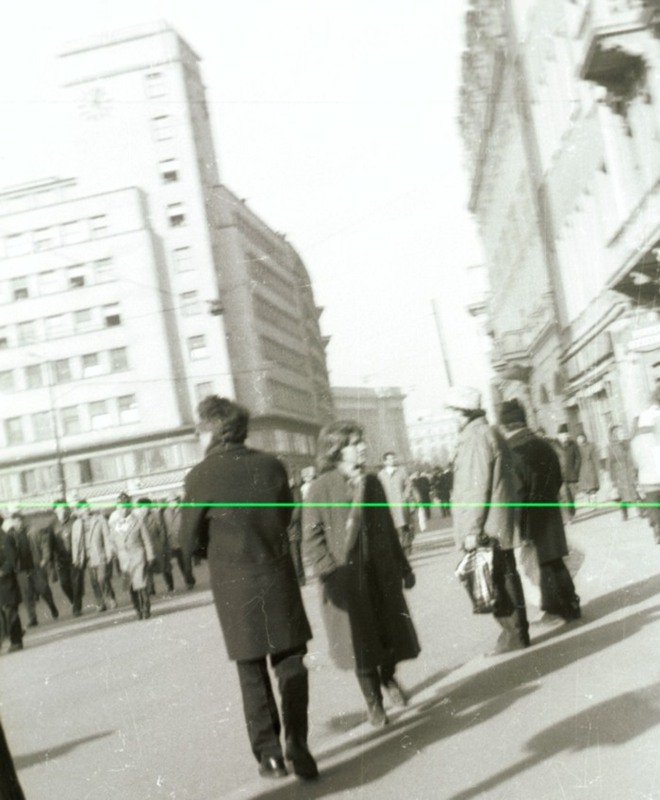 These photographs are genuine, and they have a historical significance, as I believe they are the first pictures taken in Bucharest by a civilian. 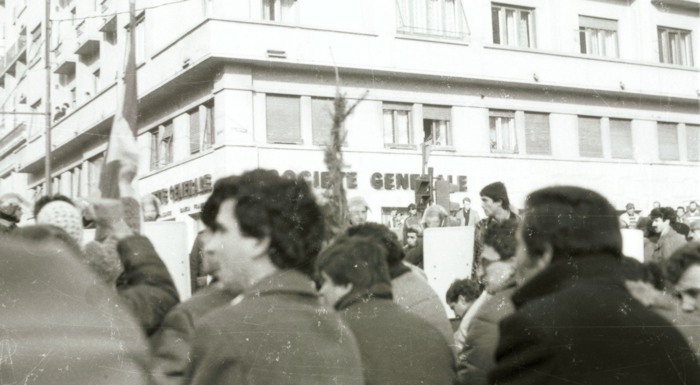 Securitate forces filmed and photographed everything from roof tops and balconies, I saw them, but these pictures are taken by myself, an ordinary citizen, in December 21, 1989, a day that changed my life, and the life of any other Romanian too. I was 19 at the time. I have taken these photos with my father's camera, a Russian made Fed camera, with a Romanian Azomures 21DIN/100ASA black and white film. I will upload the rest of the pictures after managing to scan the whole negative counting 36 shots. I post these pictures in the memory of those people I saw dying in the streets next to me, shot or crushed by military vehicles. Their blood was spilled in my neighborhood for an uncertain and disappointing future, for a hijacked Revolution. I upload these pictures also for expressing my profound disgrace with regard to those who took unfair advantage of the Revolution, including here the second and third level of the communist Romanian power, who backed Ceasescu at the time, and who have stolen our genuine Revolution, the Revolution of ordiary people who thought that going in the streets and fight may heal our nation. My disgrace especially goes with those thieves who managed to obtain illegally the so called "Revolution hero certificate". Today, 15 years after the events, Romanians still have unanswered questions such as who shot them during the Revolution, how the parallel coup d'etat could happen, and how could we let happen it. About 12.00, C.A. Rosetti Street, close to Magheru Avenue. People running from the Palace Square, after the meeting, telling me that somebody tried to shoot them while Ceasescu was still speaking. I was running counter-current while taking photos, and the only answer I got from them, after yelling at them to go back and fight, was: are you crazy? About 12.30, Victoria Avenue, close to the Continental Hotel. 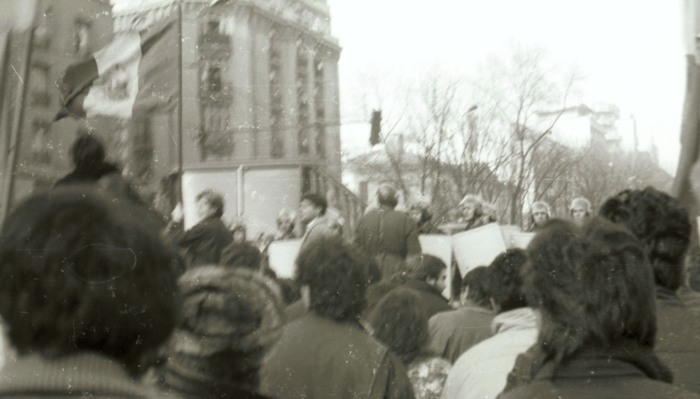 People were still running from the Palace Square, while Ceasescu was still speaking. It was forbidden to access the area while the guy was giving his speech, but it was allowed for people to flee from the site. The access points were controlled by Militia officers, and Securitate members. I have taken this photo using my camera hidden in a bag. About 12.45 - 13.15, University Square, Republicii Avenue (now Queen Elisabeta Avenue), in front of University of Bucharest, Faculty of Geology and Faculty of History. One of the earliest Securitate forces barrages, which was later removed for blocking 1848 Avenue in University Square. 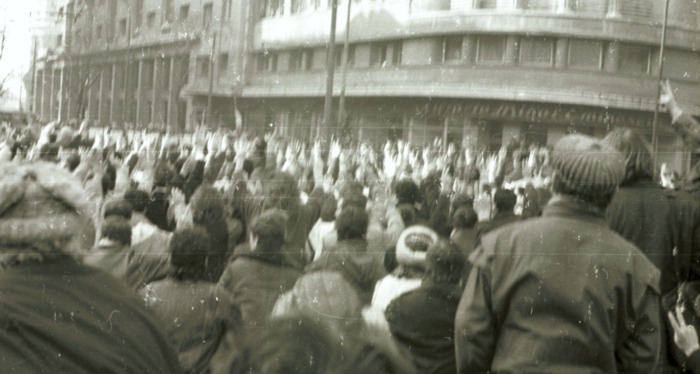 About 13.30-13.45, in front of Mihai Eminescu bookstore, on Academiei Street and Republicii Avenue (now Queen Elisabeta Avenue). 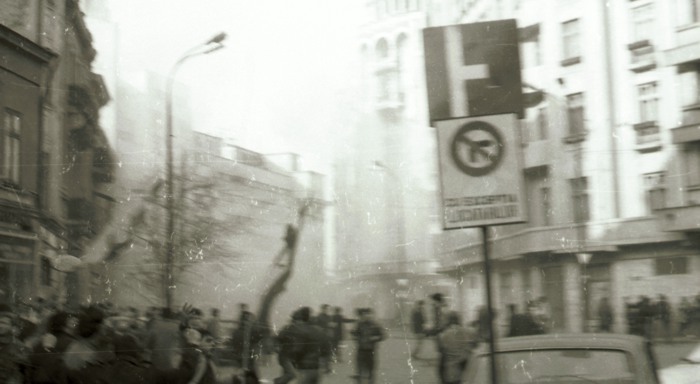 The book display on Academiei Street containing communist works, such as the famous "Homage" dedicated to Ceausescu, were broken, and the books burned or torn apart. Few years later, the "Homage" volume could be found for sale for about 1000 USD. About 13.50, Academiei Street, close to the Union Hotel. An explosive charge just blew up, note the smoke. People run, and the flags are torn apart. Few hours later, when the perimeter became very hot, this area was secured by Militia and Securitate forces for regrouping. About 14.00-14.30, Magheru Avenue and Batiste Street cross-road, in front of Societe Generale headquarters. Photo #1. The first kernel of insurgents, in front of Securitate-Militie forces barrage, blocking the main segment of Magheru Avenue. Note the uncut banner, still having the Socialist emblem, as it was too early for people to have the idea to remove it by cutting the flag. We were kneeling for signaling that there will be no violence from our side. In the back of the soldiers, the typical Securitate-Militie bus, used to deploy the personnel and gear in the city. This company of Securitate-Militie, lead by a Major-Sargeant (with his back in front of us), was deployed from Baneasa Barracks, where I was also a conscript between September 1988 and June 1989. My unit, the 43 Securitate-Militie Batallion, also known as the 0396 Unit, was deployed in Romana Square, at the other end of Magheru Avenue. I was permitted to leave the unit as a Sargeant in June, for beginning my studies as a freshman in Geology three months later, so fortunatelly I saw no action while wearing the uniform. In Romania, it was compulsory to join the army, within the Ministery of National Defence, or in the Ministery of Internal Affairs. So, I was taken beyond my wish, in the Ministery of Internal Affairs, together with all my colleagues. Few hours later, when the University Square barricade was erected on this very precise spot, the perimeter in the back of the barrage, on the other side of the barricade, was the infamous site of summary executions and profound violence against insurgents, probably undertaken by the Securitate civilian-dressed officers, the Romanian Secret Service black suits at the time, and probably not by Securitate-Militie conscripts. Today, too few remember that, and a humble cross reminds of those killings in front of the Dalles bookstore. About 14.00-14.30, Magheru Avenue and Batiste Street cross-road, in front of Societe Generale headquarters. Photo #2. The other side of the barrage, towards the Batiste Street. About 14.00-14.30, Magheru Avenue and Batiste Street cross-road, in front of Societe Generale headquarters. Photo #3. This is what the soldiers were seeing when looking at us. At that moment, it seemed to us that kneeling was the most unprovocative gesture. In the background, to the right, the University building, the Geology Faculty, where I teach since 1994. About 14.30, on Magheru Avenue, in front of the Intercontinental Hotel, close to Batiste Street and the Societe Generale headquarters (in the background). People watch the force display of Militie and Securitate, along the 1848 Avenue, on the other side of the University Square. To the left, the Magheru and Batiste cross-road, where the first kernel of insurgents was formed, the place where a little bit later the famous Universitate barricade was erected, just for being blasted by armored vehicles after midnight. - Securitate-Militie: regular troops taking conscripts, belonging to the Ministery of Internal Affairs, in charge with Police business together with the Militia. Securitate-Militie troops had blue uniforms, light gear and armor adapted for urban warfare. After 1989, this type of troops were renamed Jandarmerie (from the French term Gendarmerie). Regarding all armed forces in Romania, including those of the Ministery of Internal Affairs, it was compulsory for men to join the army, a simple refuse to obey attracting jail.